By now you've probably heard that the Mars rovers Opportunity and Spirit are suffering due to a massive dust storm on Mars. 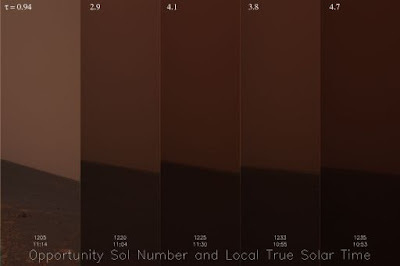 The image below shows just how much the light has dimmed over a period of just a few Sols. If you want to find out much more about this story and what the rovers have been up to over the last month check out this comprehensive report on the Planetary Society Website. Just a fantastic picture . . . . Amateur Telescope Making on a Grand Scale !